For the "out of towners" who may have seen the article below: the original Miracle Strip Amusement park that was home to the old Skyliner, is 5.8 miles from the new Pier Point at Miracle Strip Amusement Park. You can actually see the distance between the locations thanks to Google Maps here ! 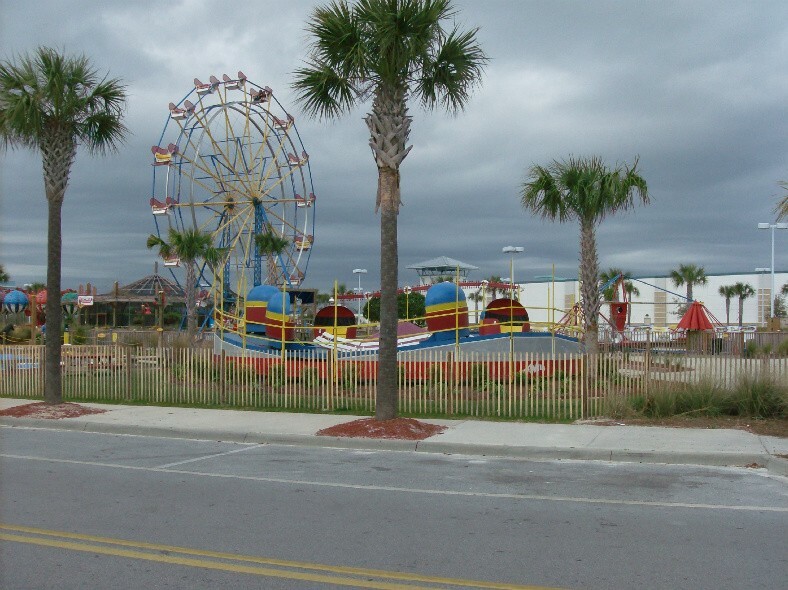 Pier Park at Miracle Strip is a small, family friendly park adjacent to a large shopping mall. The owner does have a vision to bring larger amusement rides and roller coasters back to the area, however there is no room within the existing space to do so. He has proposed to the city to redevelop the old Miracle Strip site, but there has been no positive movement to date. Today (2/23/12), ALT's local contributor Charles Thayer has taken the pictures and video walk through of Pier Point below, while you can find the original news article below the video of the site. Enjoy! 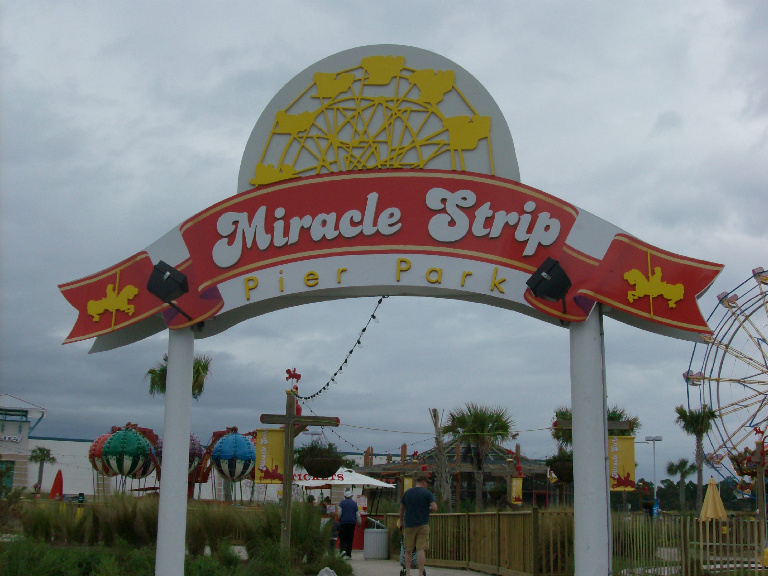 PANAMA CITY BEACH — Stepping off the new amusement ride at Pier Park’s Miracle Strip on Monday, 11-year-old Amanda Sullivan said it made her feel all tingly inside. “It felt like I was going to the moon,” she said. Her mother, Nikki Hunt of Panama City Beach, said she once enjoyed the same giant, swinging pirate ship at the old Miracle Strip on Front Beach Road. “It’s neat to see my daughter ride it now,” Hunt said. 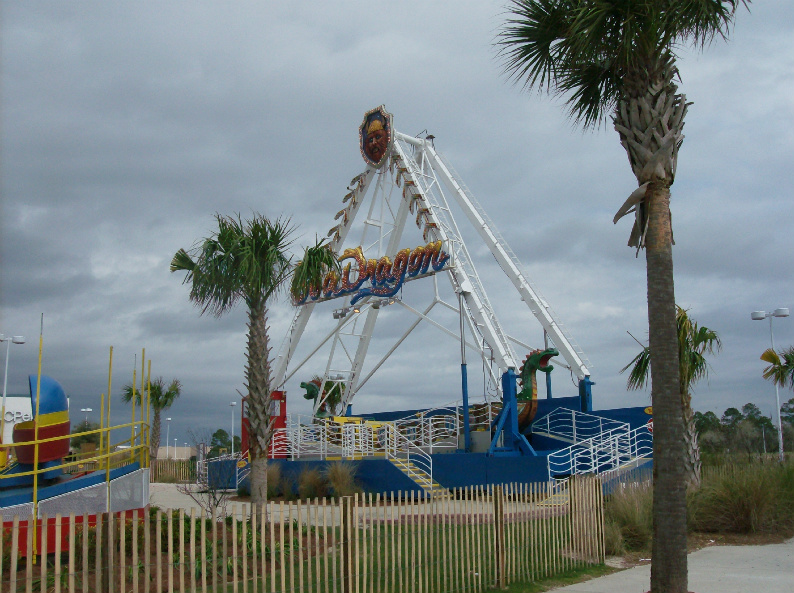 The expansion of the amusement park continued Friday with the opening of the Sea Dragon, a replica of the original ride that has been repainted and retooled for a new generation. 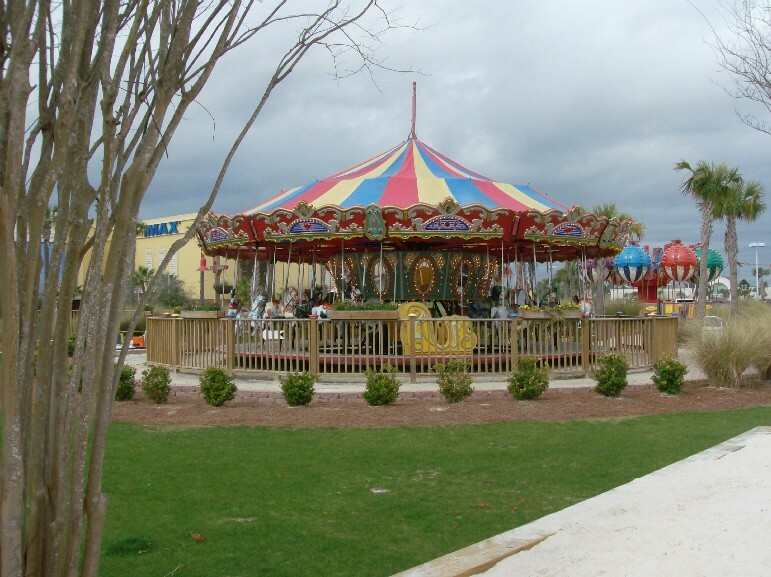 The first ride at Pier Park, a painted pony carousel that operated at the original Miracle Strip, began galloping in circles once again in April 2009 after its rehabilitation. Park owner Teddy Meeks said the Sea Dragon, manufactured in the 1980s, was tracked down in Joplin, Mo. It took three months to get the sleek contraption into shape with a new coat of paint and new hydraulics, he said. The new attraction is just the latest installment in efforts by Teddy Meeks and his wife, Jennie, to transplant many of the rides that once thrilled beachgoers at the old Miracle Strip Amusement Park before it closed in 2004. Many of the attractions currently at Pier Park, such as the painted pony carousel and the teacup ride, are the original machines that have been polished with a bright new sheen for a brand new generation. Meeks called the Sea Dragon, which can sit about 50 people, a family ride that can be enjoyed by 6- and 7-year-olds through teenagers and adults. “It’s really not a thrill ride,” he said, comparing it to faster and taller attractions. Don’t tell that to 7-year-old Hatten Alums of Dothan, Ala., however, who was there Monday with her grandmother, Debra Alums. “It was like you were flying in the air,” Hatten said. But, 6-year-old Grace Ann couldn’t get enough. “You get to go so high, it feels like you are going to heaven,” she said. 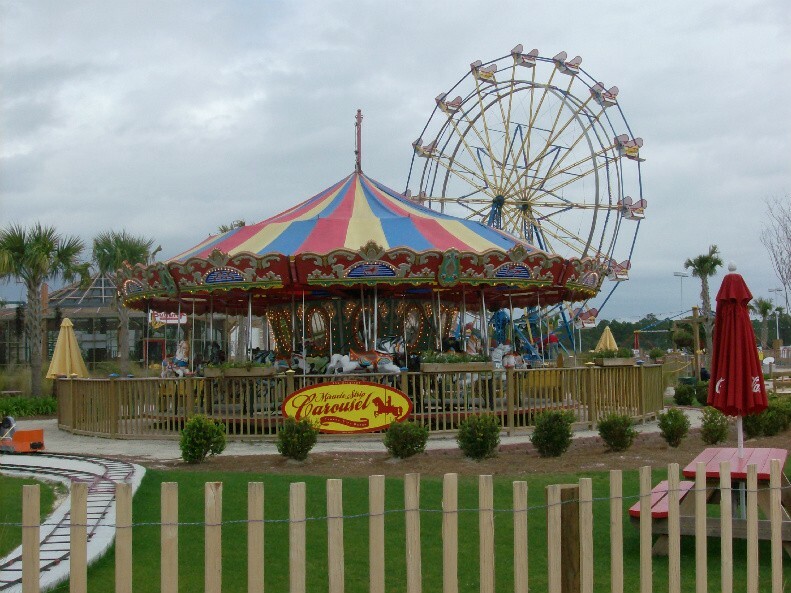 With Spring Break just three week away, Meeks said the amusement park and the new ride were geared toward families who might not want to fight the college crowd at the annual beach party, and business was brisk in March and April last year, as well as during the summer season.